Are you in the middle of Christmas frenzy yet? I swear, I think it gets crazier every year! 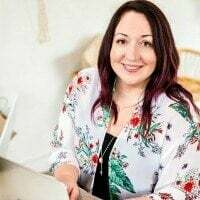 I keep trying to scale back on the have-to-do list, but I love getting together with friends so there just have to be some parties in the mix, busy or not. One of my favorite things to do during the Christmas season is host a holiday brunch. Since brunch is more casual than an evening dinner party, I think prep is easier on the hostess. Usually people have a little bit more schedule flexibility earlier in the day, too, and a brunch is a fun way to get together during this busy season. It also seems guests are glad to have one less meal to prep before taking off for a day of shopping! A buffet of dishes that can be mostly made ahead of time means the hostess has time to enjoy the get-together too. 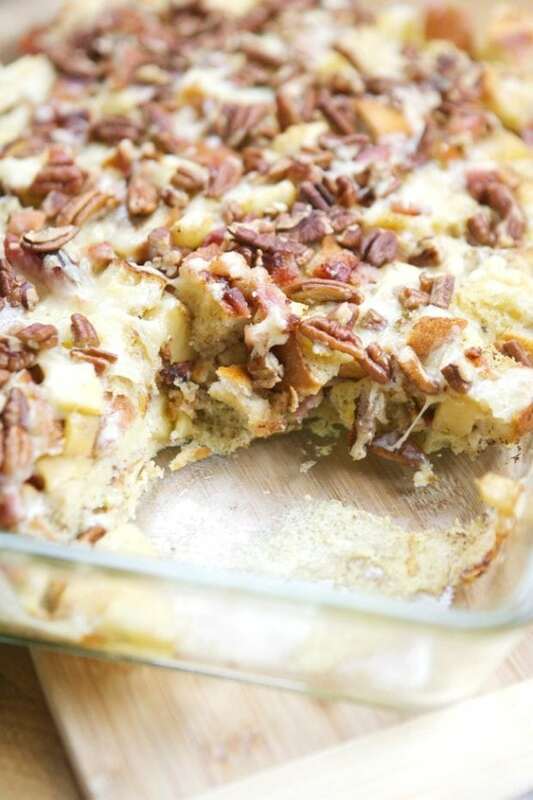 Past experience tells me guests really go for French toast so this year I’m making the Apple and Bacon French Toast Strata recipe from Burnbrae Farms. 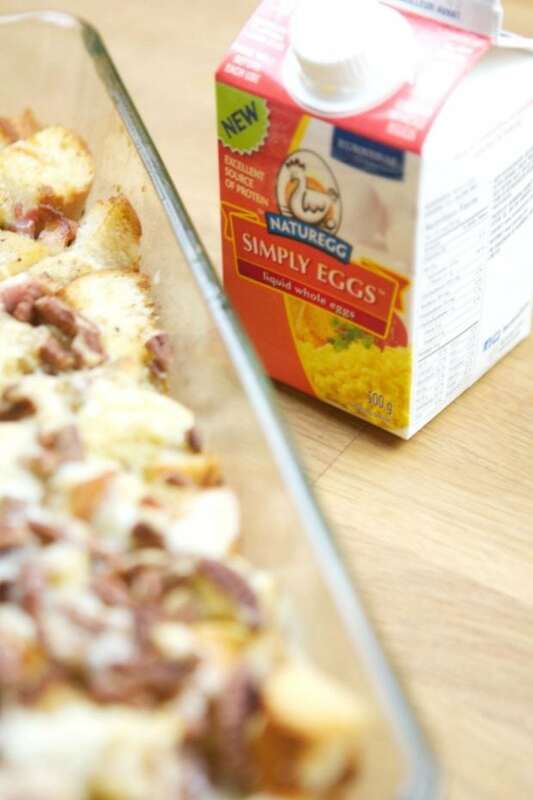 It uses Naturegg Simply Eggs™ liquid eggs, which makes it even quicker and less messy to fix. Since any holiday gathering has to include a few sweet somethings, I really like including a dish like this with high quality protein eggs to balance things out. 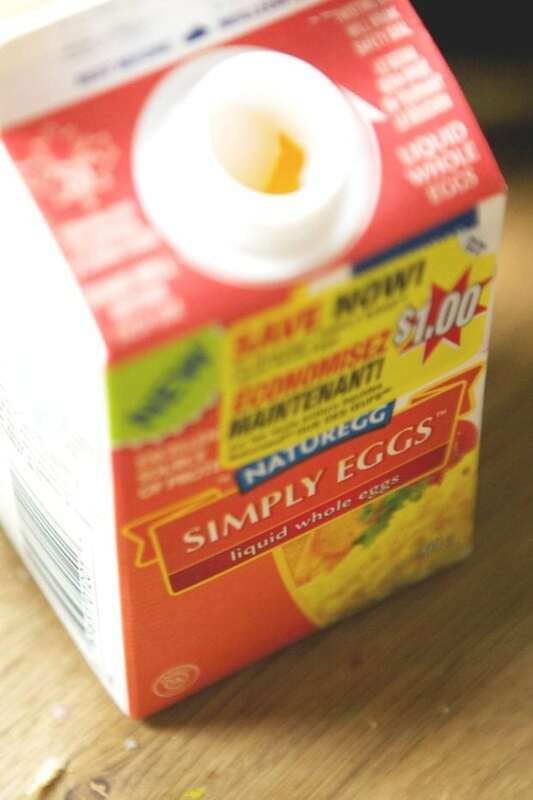 Burnbrae Farms Naturegg Simply Eggs™ liquid eggs are all natural, with no added ingredients or preservatives. The eggs are a source of 10 vitamins and minerals. They’re pasteurized, Kosher, and ready to use. Just make sure they’re well-shaken and pour out the amount you need. You can also freeze them for up to three months so you’ll always have eggs on hand for all of the holiday baking and cooking—very convenient. Set a large skillet over medium heat. Add the bacon and cook for 5 minutes or until slightly crisp. Remove half of the bacon pieces; set aside. Drain off all but 2 tablespoons (30 mL) of the bacon fat. Add the apple to the skillet. 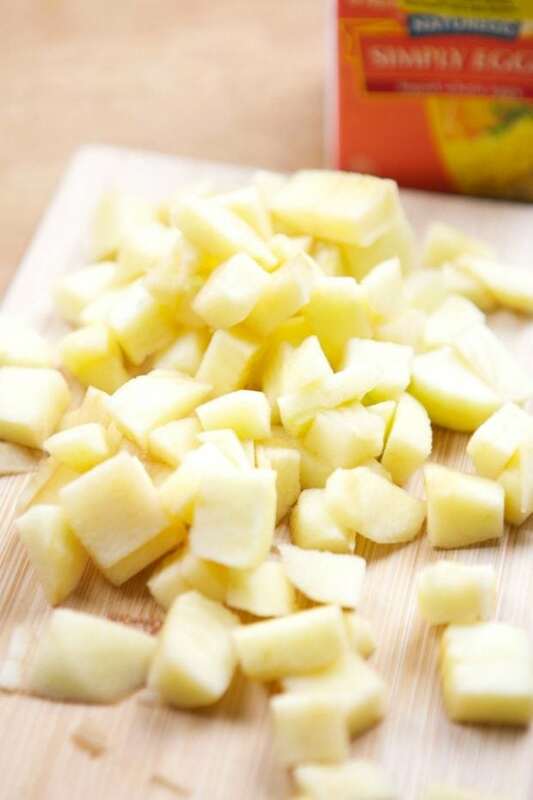 Cook for 5 minutes or until bacon is crisp and apple is slightly tender. Grease a 9 x 13-inch (3 L) casserole dish. Toss the bread with the skillet mixture. 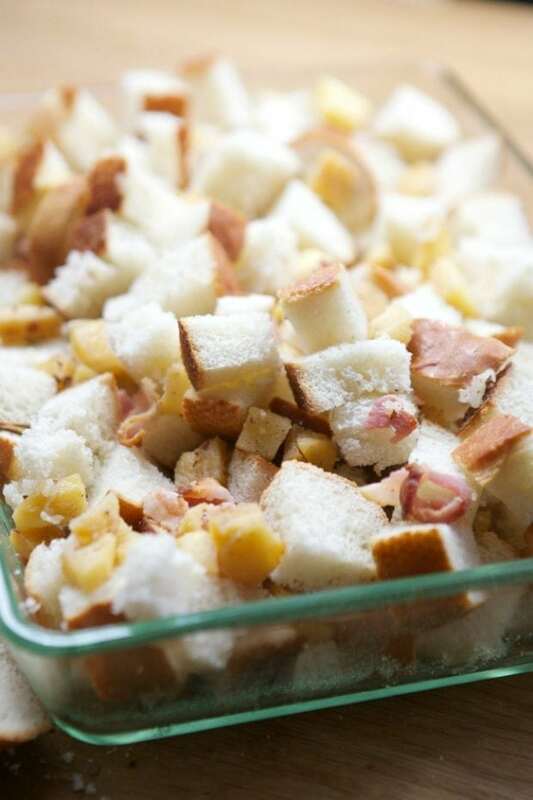 Spread out in an even layer in the prepared casserole dish. Whisk eggs with milk; pour evenly over the bread mixture. Cover with foil and let stand in the refrigerator for at least 1 hour or overnight. Preheat the oven to 350°F (180°C). Place the casserole in the oven and bake for 30 minutes. 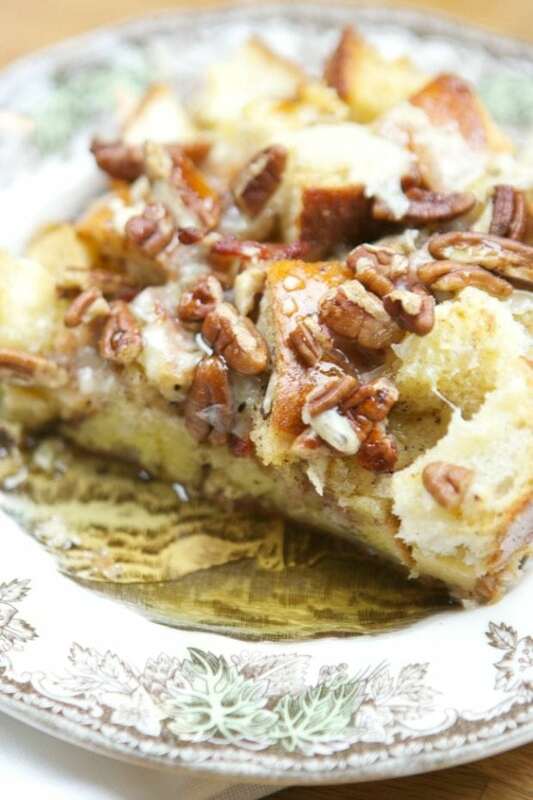 Uncover and sprinkle with reserved bacon, cheese and pecans (if using). Bake for an additional 25 minutes or until top is golden brown. Cool slightly and serve warm. 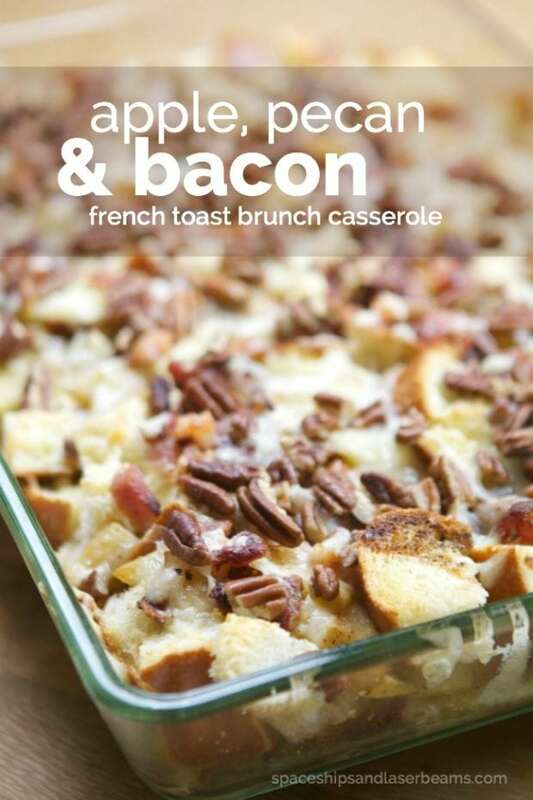 Serve with maple syrup on the side. 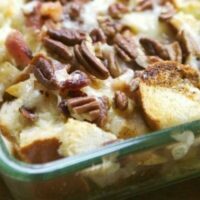 This sweet and savory strata can be prepared the night ahead and simply popped in the oven when you roll out of bed. Keep up with Burnbrae Farms on social media as well via Facebook and Twitter. I cannot describe how great this is. Everyone loved it.